Running out of ideas to keep the little ones busy this summer? If you are home with the kids like myself, you probably feel the struggle of keeping them occupied on the daily. I came up with the idea of a DIY Summer Camp at Home to keep Bella occupied while I am working from home with things she loves like reading, crafts, and activities. Summer camp isn’t always an option for many families, but that doesn’t mean you can’t create your own at home DIY summer camp! Week 2 of DIY Summer Camp at Home is here! This week is all about exploring dinosaurs! From books, to sensory bins, crafts and more, your little one will love learning about dinosaurs through creative play. Whether your little one is gearing up for their first year in school, or they are already in school, reading is important to keep up over the summer months. Bella just finished junior kindergarten and is a book-worm! She loves to read, so including reading into our weekly at home summer camp was a no-brainer. 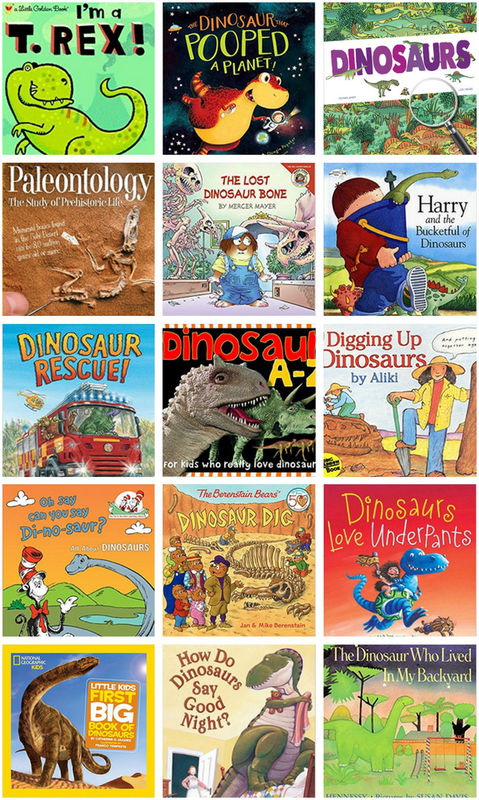 Below is a great list of dinosaur themed books to pick from to include in your summer camp. I have linked to the books on Amazon.ca for my Canadian readers, and Amazon.com for my US readers. All you have to do is click on the book title to be taken to the Amazon page for that book! 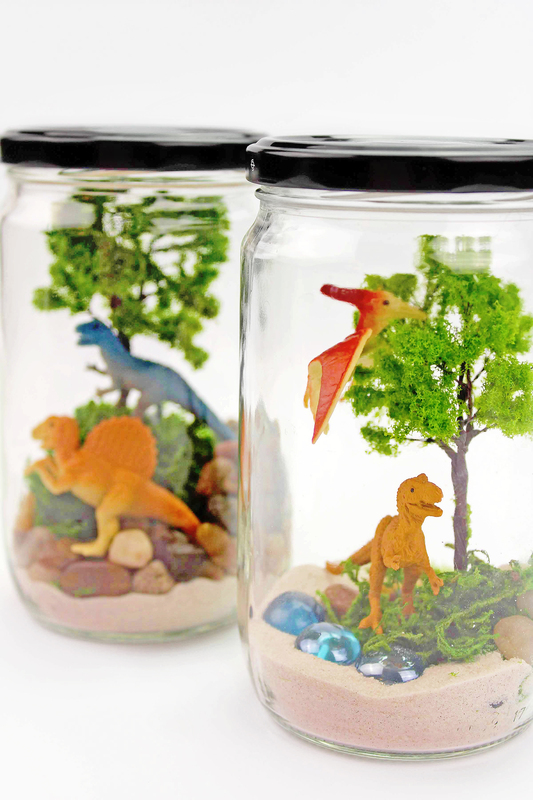 Creating a dinosaur terrarium is a great way for little ones to explore different textures. It also requires them to get creative and use their imagination. This is a great craft to do after reading a book about dinosaurs. 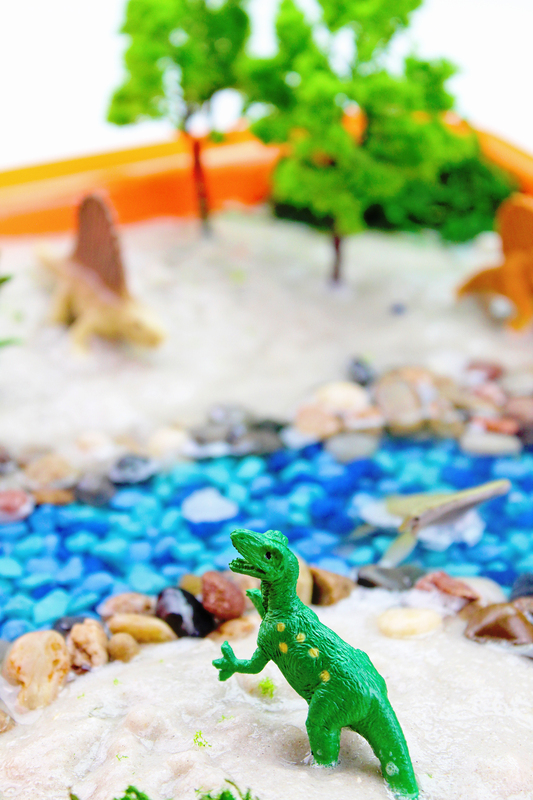 Your little ones can use their memory to recreate their very own dinosaur habitat! Clean out a glass jar. Use one that doesn’t have bumps or ridges. 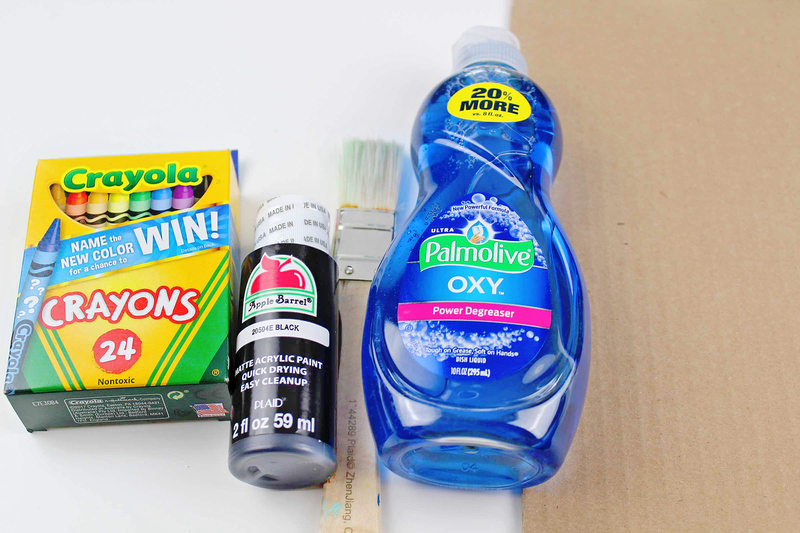 Remove any label residue with a little bit of WD-40 and a paper towel (do this outside). Cover the bottom of the jar with moss, sand and rocks. Add a blue pebble river! Coat a piece of foam with glue and cover it in moss. 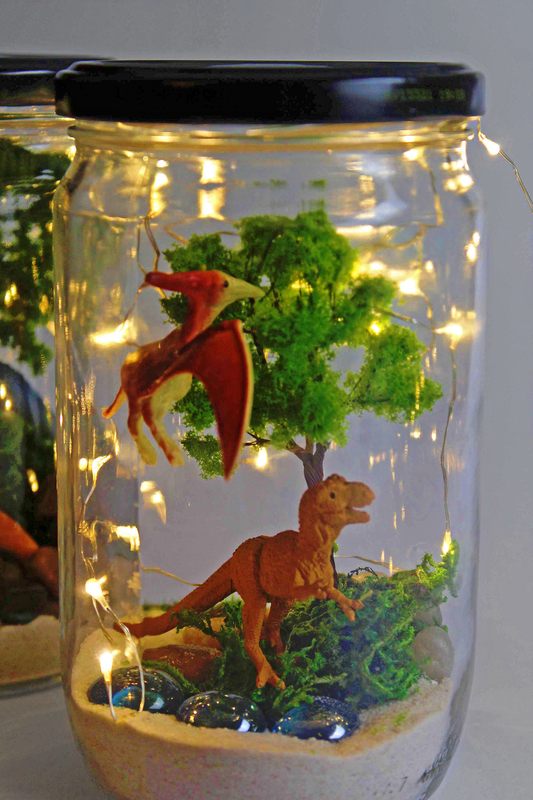 Attach a fake tree and a mini dinosaur. Glue the mossy hill inside the jar. Play around with the materials you have. There’s no wrong or right way. You can even include grass, sticks, leaves etc from outside. To create a fun night light, add battery operated fairy lights to the jar. Kids love to colour and it is a great activity to enhance their fine motor skills. If your little ones is preparing for school, encourage and help them practice holding their crayons, pencil crayons, or markers the proper way. This is a skill we are still working on with Bella, and one that is important for proper writing. One trick that works well is having them put something under their ring and pinky fingers. Those two fingers are supposed to bend toward the palm while the other fingers do all the work. However, many kids have a difficult time with this because they can’t separate the two sides of their hand. This little trick will help take care of that! It doesn’t matter what they put under their last two fingers, as long as it isn’t too big or too small. Some items that work great are: a cotton ball, small ball of play dough, bead, or a marble. Younger children love worksheets. Especially if they have older siblings, they feel special having their own “homework”. One of Bella’s favourite things to do is grab her big binder full of laminated worksheets. She spends hours daily learning. In her little mind it is a fun activity, for me it is peace and quiet! We finally picked up a larger binder for her as the original one we had became too full. If you’d like to make your printables for long-term use, I highly suggest laminating them. Invest in some good quality dry erase markers in a variety of colours too for colouring/printing. Creating sensory bins was one of my favourite things to do when I worked as an ECEA in a private daycare. 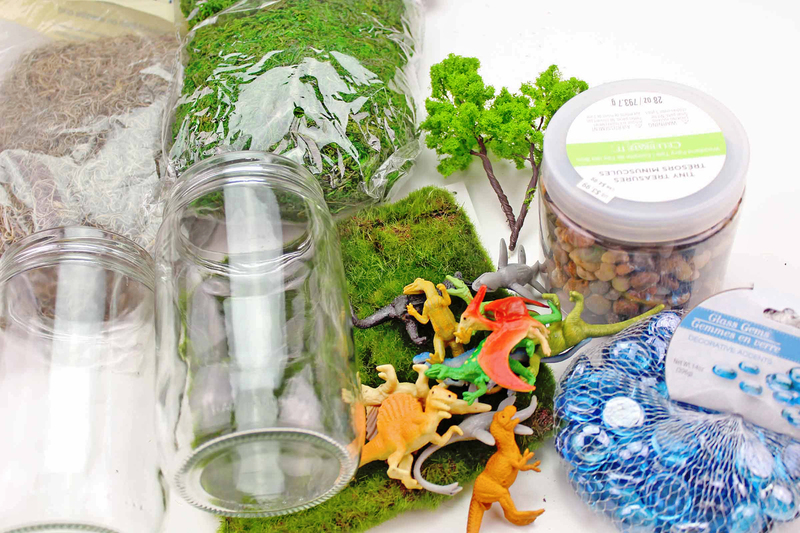 This dinosaur themed sensory bin is packed with fun, learning, and lots of different textures. 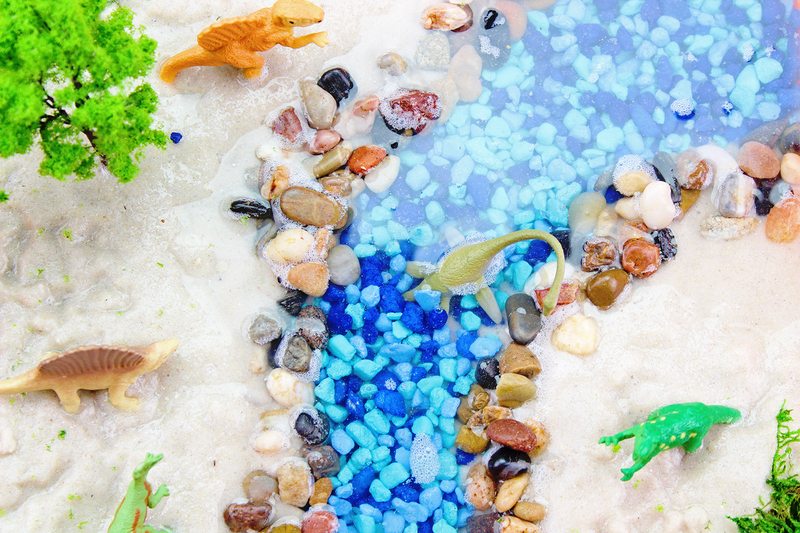 Add the wet sand to the sensory tray leaving some space for your river. Put the blue gravel on the bottom of your river, then line the river with small rocks. Add water to the river. Place some mini fake plants and trees in the sandy areas. Add moss, sticks, leaves or any other items that you’d like. Place your mini plastic dinosaurs in the sensory tray. Invite your child to explore, play and have fun! 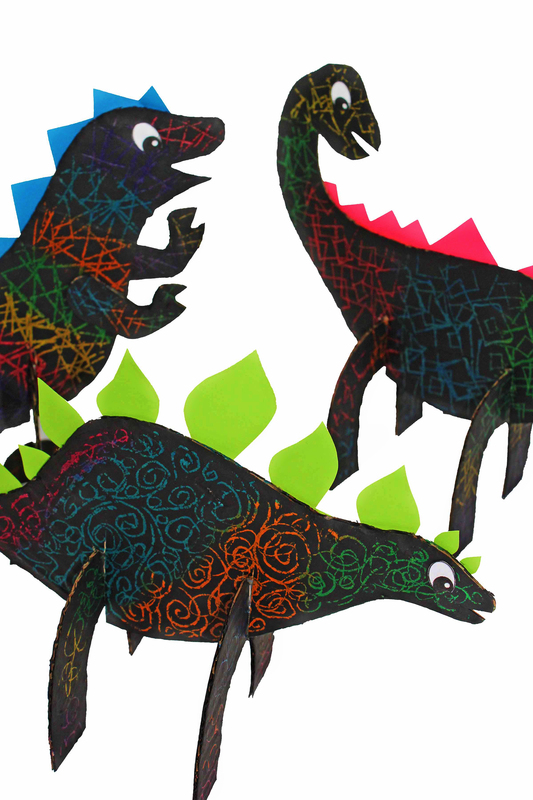 This dinosaur scratch art craft is super fun and it helps continue to improve fine motor skills. Afterwards they can play with their creations! Scratch art was a huge part of my childhood. Not only is it super fun, it keeps the little ones busy! 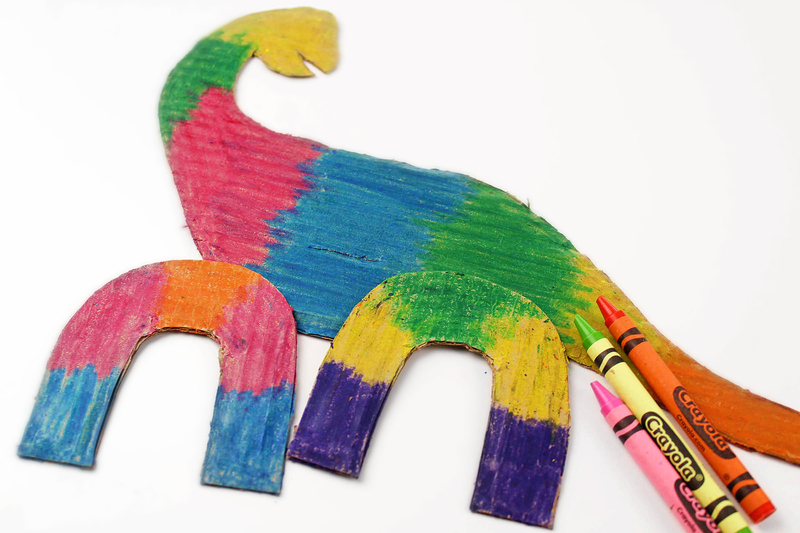 While this is a specific activity using cardboard, you can certainly pre-prep an extra stack of scratch art sheets for when they are done the dinosaur. Get creative, cut them into dinosaur and dino egg shape sheets. Endless hours of scratching fun! If you are going to make extra sheets, I suggest using thicker paper, like cardstock, so when they scratch they don’t rip through the paper! Download and print out the dinosaur templates. Cut the templates out and trace them onto cardboard. Colour the cardboard with crayons. Use lots of different colours. Mix 1 drop of dish soap with 3 drops of black paint. Paint over the entire dinosaur, covering all of the crayon. Use something pointy (but safe) to scratch designs into the black paint. Assemble the dinosaurs and secure them with a dab of glue. 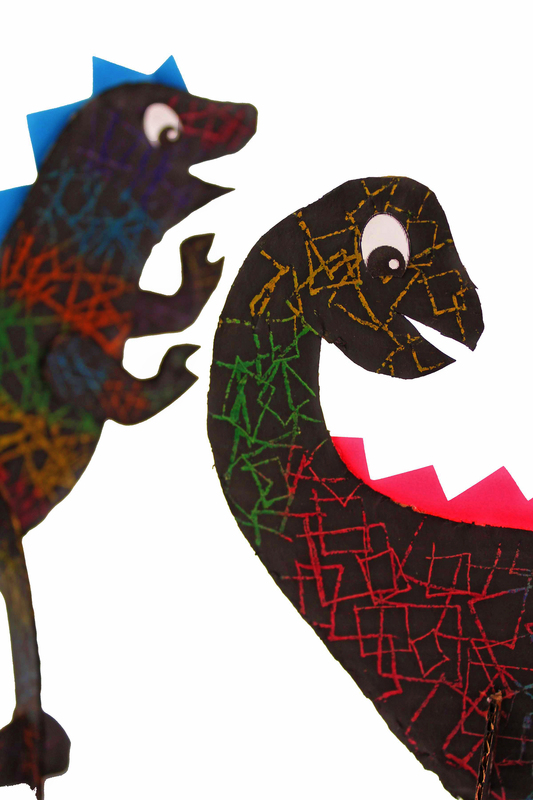 Cut spikes from coloured paper and glue onto the backs of the dinosaurs. Gather all the supplies you will need to make your craft. Let the kids colour the cardboard with a variety of coloured crayons. 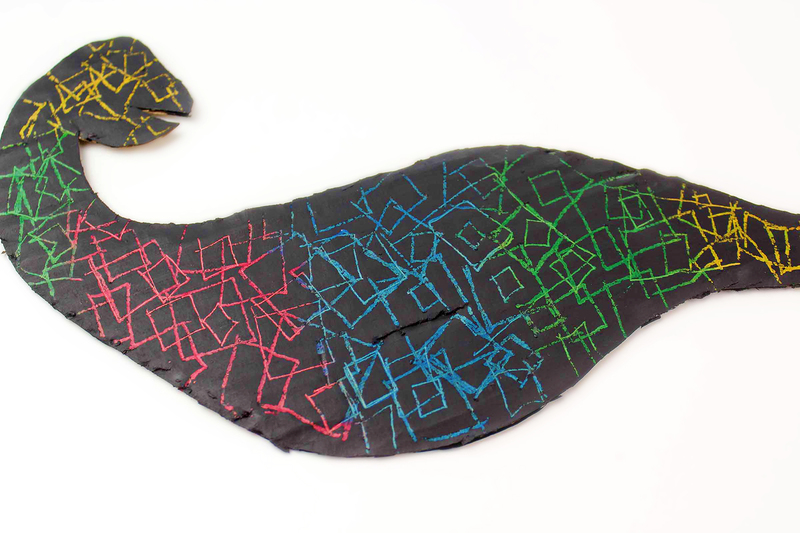 Mix 1 drop of dish soap with 3 drops of black paint and allow your child to paint over the entire dinosaur. Once the paint is dry, use something pointy (but safe) to scratch designs into the black paint. Assemble the dinosaurs, secure them with a dab of glue, and allow them to dry before playing with them! Bella loves to explore different ways to paint. 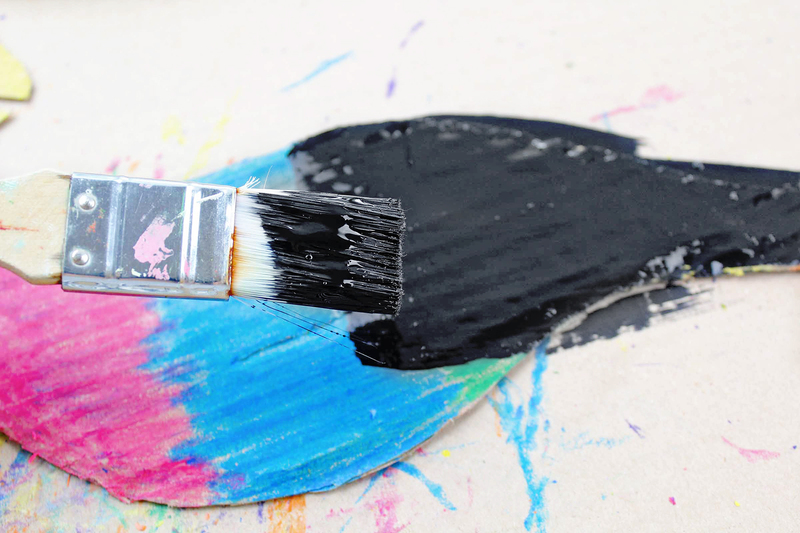 Little ones will learn how painting with different items create different textures. 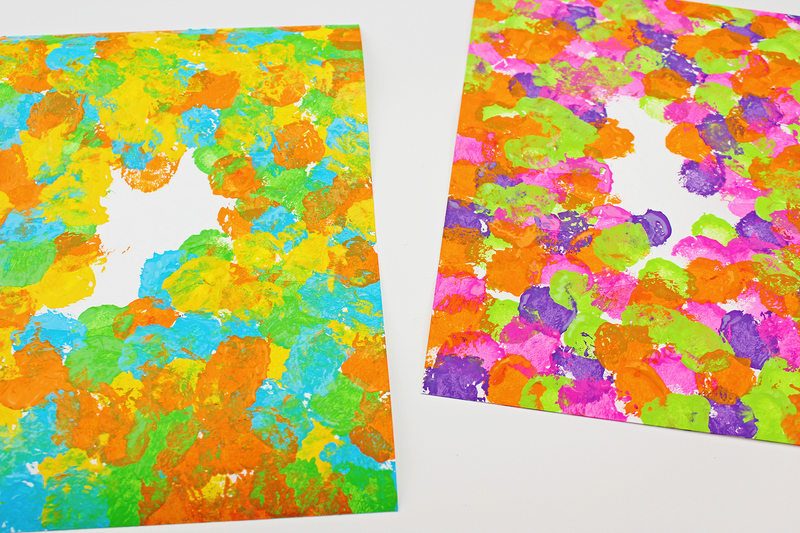 This dinosaur cotton ball painting craft is super fun, especially the reveal at the end! Download and print out the dinosaur template. Trace the template onto contact paper and cut out. Peel the backing from the contact paper and stick the dinosaur onto the cardstock. 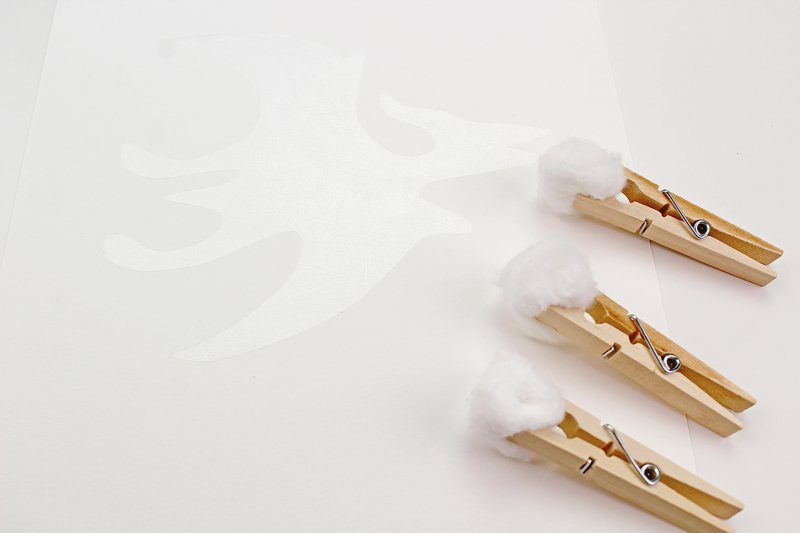 Clip cotton balls with clothespins. 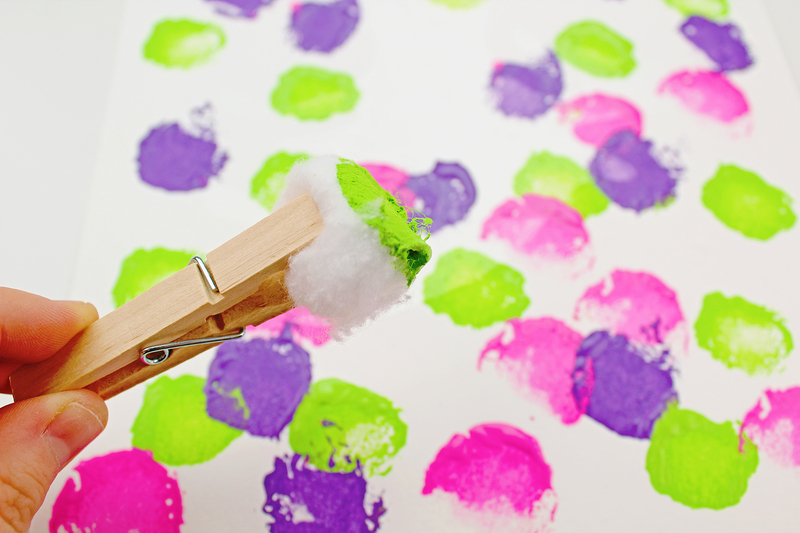 Dip the cotton balls into different coloured paint and dab onto the cardstock. Keep dabbing the paper until it’s completely covered. Carefully peel the contact paper off to reveal your dinosaur! Gather the supplies you will need for this craft. 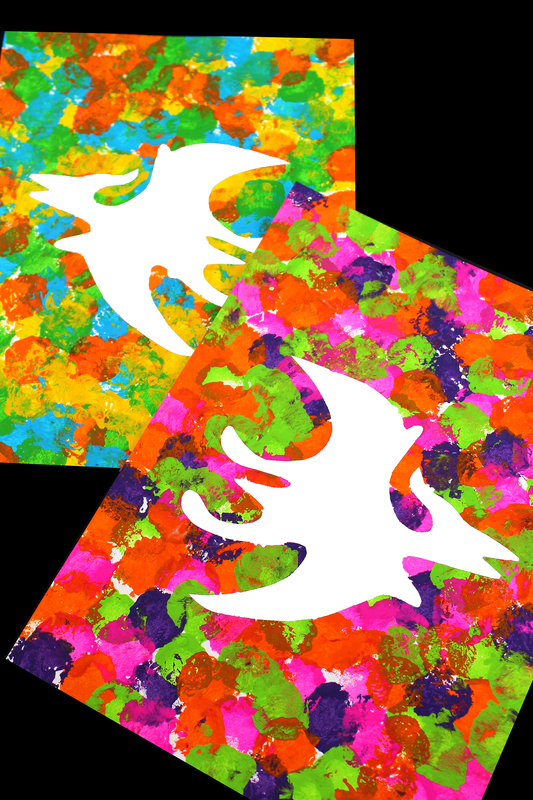 Once you have traced the template onto contact paper, cut it out and stuck the dinosaur onto the cardstock, clip cotton balls with clothespins. 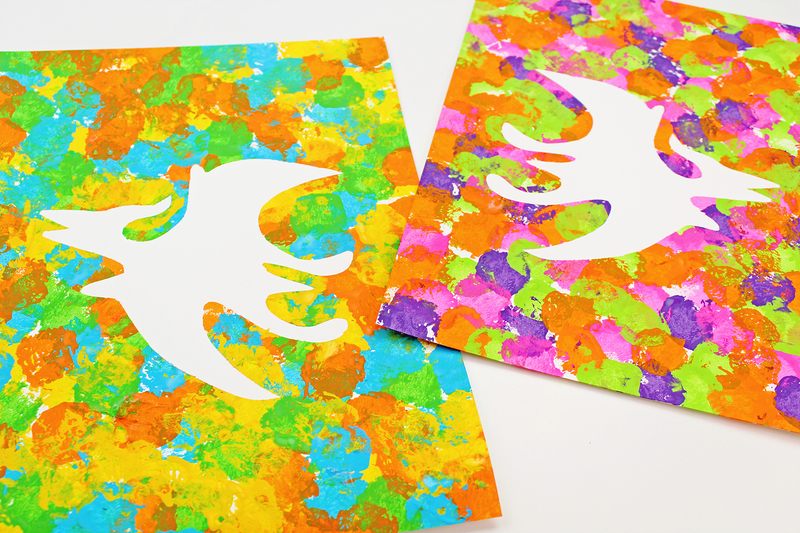 Allow the paint to dry completely before carefully peeling the contact paper off to reveal their masterpiece! If you have little ones, a laminator is a great investment! By laminating all of Bella’s learning pages, it allows for her to use them more than once, and for us to pass them on when we are done with them. Amazon is where I bought my laminator, and where I buy all of my laminating pouches. They have the best deal on laminating pouches, cheaper than Walmart (I checked), so buy them from Amazon if you don’t have any at home! 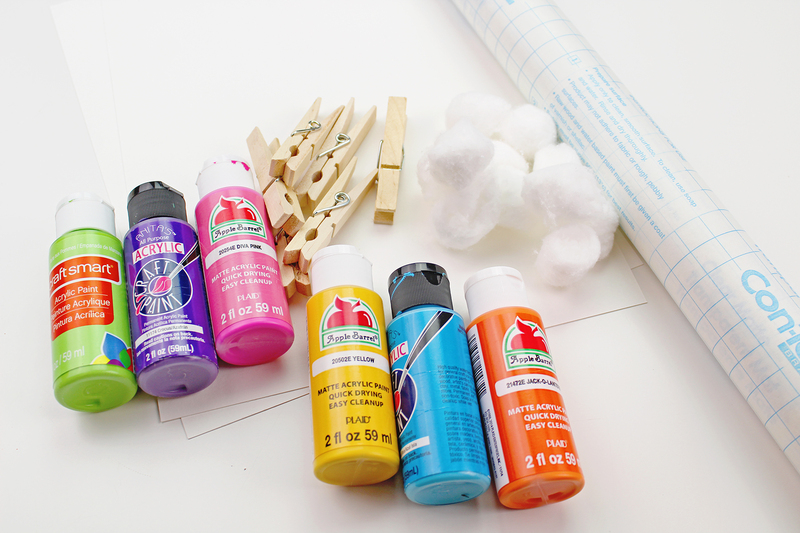 Don’t forget to check out the Kids Corner section for more great crafts, printables, and learning fun! 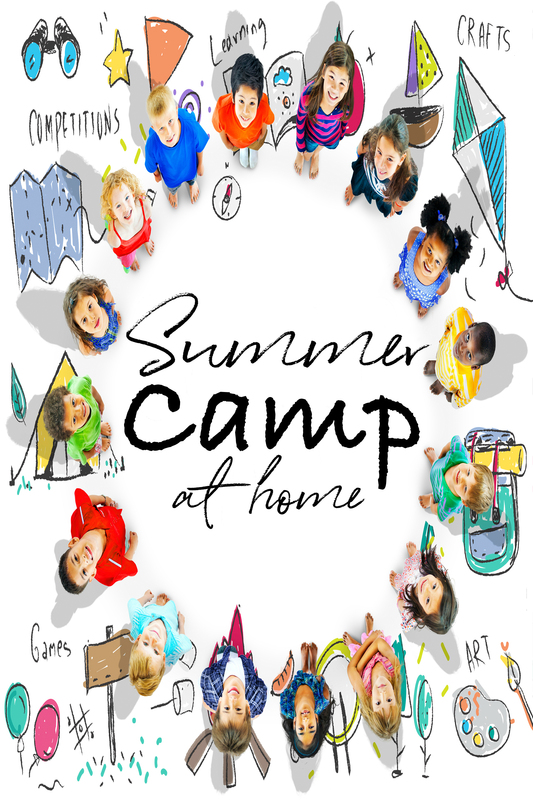 The printables included in this DIY Summer Camp at Home may only be printed for personal or school/daycare use. 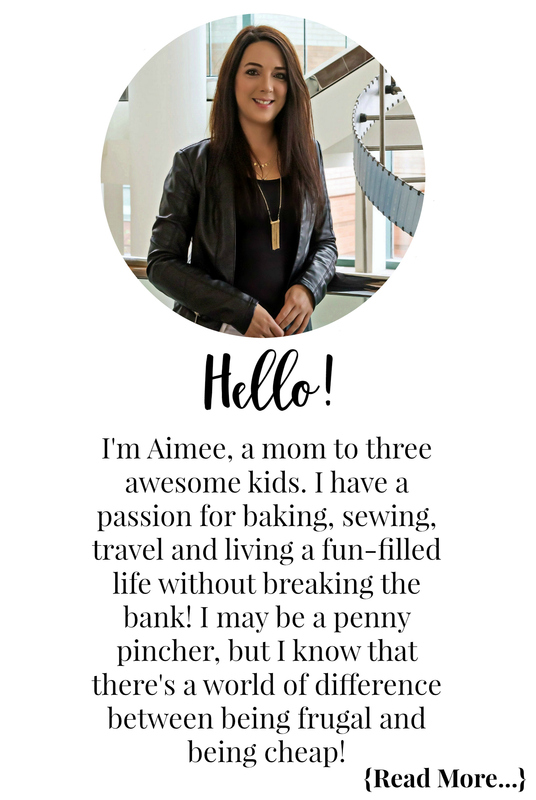 They are not to be distributed or offered elsewhere in any format without consent from ExtremeCouponingMom.ca. You may not distribute them on any web page, in any digital format, or to others in any print format or in any other format, whether commercially or for free. No parts of these printables may be modified or used in any other graphics in any format without consent from ExtremeCouponingMom.ca. 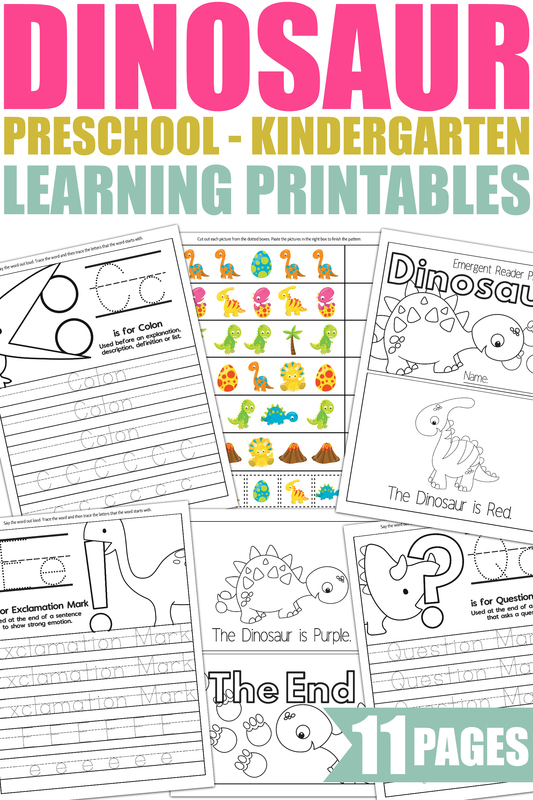 These printables, or any portion of these printables, can not be printed for commercial purposes, or printed for any other purpose than for their intended purpose for personal or school/daycare use. Do not link directly to any of the PDF downloads of these printables. If you would like to share them online, you are more than welcome to create a link to this blog page’s URL. Thank you!